Jerry sent me these two photos from his 1960s racing career. He was one of the last to campaign Max Balchowsky's Ol' Yaller Mk.II. After that, he moved on to a Cheetah. Jerry in Ol Yaller Mk.II #71 at Santa Barbara in 1964. 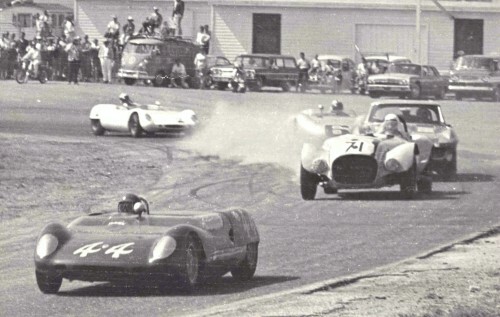 Frank Monise leads here in a Lotus Mk.23; Tony Settember follows Jerry in the Stingray. Next are Al Cadrobbi in #6 Porsche RSK and Bob Challman in #2 Lotus Mk.23. Jerry in the Cheetah at Stardust Raceway in Las Vegas, 1965. He won the event, the first club race held there. Leaning into the car in the cowboy hat is Max Balchowsky. "I bought the car off John Brophy. I met Max Balchowsky and asked him to help me run it at the upcoming race at Santa Barbara. Max said I would get accustomed to driving the car if I drove it up to Santa Barbara from my home. My brother Dennis and I climbed in and away we went. This was 1963. The car ran great and we went up along the ocean and had a great time. Max was there and told me to take it easy and get accustomed to the course. A friend of mine named Buzz Naylor introduced me to Vasek Polak who was running a car for him there. Jay Hills was also driving for Vasek. I also met Bruce Kessler who was driving a Cooper Monaco. I went to school with Bruce's sister Mimi and he was very nice. Jay Hills told me to follow him around the course and he would show me how to go through the turns. He was in a Porsche RSK. I turned the second fastest time to Bruce's Cooper. Jay said when the race started I should stay behind him and Bruce Kessler and just follow them and learn how to race and have a good time. Max said the same, only he said stay behind for a few laps and if you feel OK pass them. This was my first race. I had drag raced for years and knew how to start good but I hadn't really driven road racing. At the start Bruce seemed like he was way too slow so I passed him easily. I made it to the first turn and shot off the course. I had to wait until everyone went by and then get back on course. I believe I only finished 8th. I was young and wouldn't listen to my elders and paid the price. 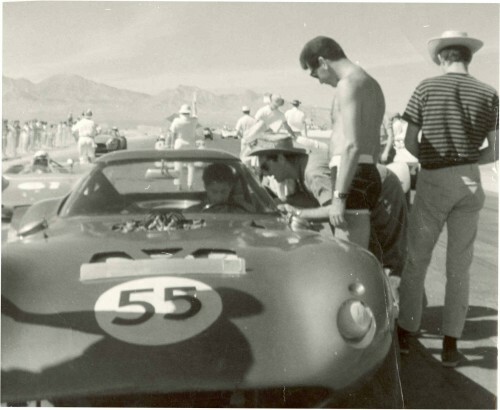 The Cal Club group in the early 60's were a great bunch of guys and racing was a lot of fun." Back to: Whitey Thuesen's Amazing "Solitary Wasp"